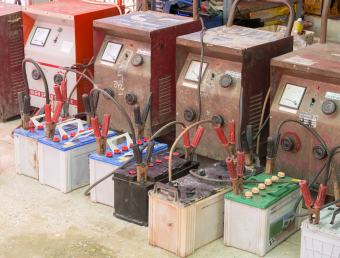 James M. asks: Why does putting a car battery on cement cause it to drain when the casing is made of plastic? Shouldn’t that insulate it? So how did this pervasive myth get started? As with so many such myths, it once had a basis in fact- a remnant of an era when car batteries were made of different materials. For example, some of the earliest car batteries were composed of lead-acid contained in glass cells, all encased in a tar-lined wooden box. Placed on a potentially damp surface such as concrete, the moisture could cause the wood to swell and shift, and the glass cells to break, damaging the battery. 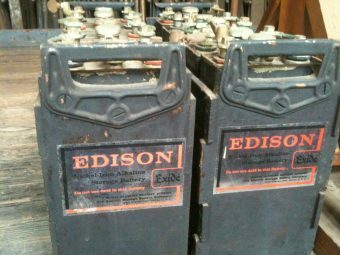 Advancements in battery technology ultimately led to a nickel-iron battery known as the Edison cell, which was more durable but also had a downside in its classic form. Encased in steel, an Edison cell battery placed directly on a concrete floor would discharge more quickly than normal. A subsequent innovation, encasing the battery in hard rubber, also had its drawbacks, as rubber is both made of carbon and a bit porous. Between the carbon and the pores, together with moisture and a concrete floor, this could potentially lead to a path for the electricity to flow, resulting in the battery draining. Today all of these automobile battery-destroying or current-conducting flaws have been eliminated by using plastic shells around the various types of battery designs. And the potential problem of damage to the concrete floor from battery acid leakage has also been mostly mitigated, as previously noted by Interstate Batteries. However, it is important to note that today’s batteries will still ultimately be drained just sitting there, just in different ways. For example, if a battery’s terminals are dirty with a combination of dirt, dust and leaked acid, the filth can potentially create a circuit between the terminals, draining the cell. This is, of course, easily prevented by cleaning the top of the battery case before storage. What’s not preventable, however, is the fact that, as with all batteries, a car battery will self discharge over time due to certain chemical reactions occurring within the cells. In fact, a discharge rate of 1%-25% per month for modern lead-acid car batteries without any load is typical, with the two major factors on discharge rate being temperature and age of the battery. On top of that, the overall lifespan of the battery is also diminished when kept in hot weather vs. cold, with lead-acid car batteries having about a 60% increase in expected lifespan when kept in cold climates instead of tropical ones according to Pacific Power Batteries. The idea that cold weather is bad for these types of lead-acid batteries used for automotive purposes most likely derives from the fact that in extremely cold weather a battery may seem drained when one tries to start a car, with the car potentially cranking slowly or not at all. Assuming the battery was properly charged before the car was shut off, in most cases this is not because the battery lost its charge but because, due to the aforementioned slowing of chemical reactions, a cold battery simply isn’t capable of outputting as many amps to the starter as when it’s warm. An old battery on its last legs may also be exposed as such in this scenario with its cranking amp ability already diminished with normal age-related reduction in capacity. On top of that, the problem is (potentially) made worse by the fact that an extremely cold engine may in some cases take more cranking amps than normal to turn over- all potentially contributing to people thinking cold weather is worse for the battery than hot. For reference here, according to Industrial Battery Products, a typical lead-acid car battery will see about a 50% drop in its normal cranking amps at -22° F (-30° C) vs. around 75° F (24° C). On the flip-side, that same battery would see about a 12% increase in cranking amps at 122° F (50° C) vs. 75° F (24° C). Thus, if you were to place a cold lead-acid battery back in a relatively warm environment, once it warmed up, you’d find its cranking amps restored and that it actually would have maintained its charge level much better in the interim while it sat there vs. stored in a hot environment; this is all thanks to the very same slowing of chemical reactions that reduces the battery’s cranking amp output ability in colder temperatures. So, in the end, cold storage is ideal for this type of battery (and many others) if one is interested in extending the battery’s useful lifespan or otherwise conserving as much energy potential as possible when storing the battery, which for most people’s car usage is what they’re doing with the battery the vast majority of the hours of the day. And if you make sure to get a battery with a large enough buffer of cranking amps for your particular car (which is generally the default option anyway), the reduction in cold weather shouldn’t be much of an issue until the battery is nearing the end of its lifespan. Now, you might at this point be wondering about extreme cold weather scenarios. The chemical reactions going on in the battery leading to self-draining continue to slow (and the overall lifespan of the battery continues to increase) the colder the battery is kept. However, there does come a point when the water content of the lead-acid batteries may freeze and crack the cell casing. But this physical damage isn’t something most outside of the coldest environments ever have to deal with. For reference, according to Interstate Batteries, a fully charged lead-acid car battery shouldn’t have any freezing issues until around -76° F (-60° C), whereas a fully drained battery will begin to freeze at just 32° F (0° C)- the lesson here being you definitely want to make sure a car battery being stored in cold weather areas starts out with at least some charge. And as long as it is charged up in such environmental conditions, the cold weather will actually be functioning to extend the car battery’s overall useful lifespan, not hurting it, as so many think. Do Cement Floors Ruin Car Batteries? This started in the Ford Model T Instruction manual. It said to store batteries in a sheltered place, but not on concrete or on metal shelves. The reason was to avoid damaging the concrete or metal.